The recent school shootings in Florida and Texas are stark reminders about the responsibility of district leaders to solve a very pressing problem — that of keeping our children safe. The solution calls for a combination of soul-searching and strong will: soul-searching to create a school renovation safety plan and to find the money no matter what, and the will to follow through and get the job done. Embedding safety and protective features is a top priority in new construction. However, making our existing school buildings safer is a challenge. Many students still go to school in buildings constructed in the 1960s and 1970s. In these buildings, safety issues vary widely according to not only the design of the building, but the physical layout of the grounds and the way they are integrated into their community. That said, virtually all have similarities that allow immediate upgrades for a more secure school environment. Many safety concerns can be addressed without completely renovating older buildings, says Paul Timm, a board-certified physical security professional and vice president of physical security at Facilities Engineering Associates in Fairfax, Virginia. One of the biggest things schools should be focusing on right now is access control, according to Timm. All buildings today should have a single point of entry. There should be a secure vestibule at the main entrance and all doors must latch and lock properly. Many schools have vestibules at the main entrance, but they aren’t secure because schools permit visitors to immediately access the main office or the building in general. A secure vestibule allows a visitor to come through an initial door, but they cannot enter the next set of locked doors until they are authorized by main office personnel. The best way to facilitate this is to install a pass-through window. Once visitors come through the initial door, they pass an ID through the window and state their purpose for being in the building. Once main office personnel determine the purpose is legitimate, they unlock the next door so visitors may enter. In addition to a school’s main entrance and door hardware, the design of a school may create risks and require some retrofitting. For example, newer buildings typically have large windows to allow for more natural light. While this is aesthetically pleasing, it may allow a perpetrator to easily see into parts of a building, either from outside or inside. To remedy this, tempered glass windows can be replaced with laminated glass or bullet-resistant glass. Schools also can create parking spots for police vehicles near main entrances or provide school resource officers with an office nearby to allow for natural surveillance. However, even something as small as bright exterior lighting and trimmed vegetation can help because mature vegetation and bad lighting create concealed hiding places for perpetrators. As opposed to newer buildings that tend to follow a functional, open layout, the layouts of older buildings vary greatly and tend to be more like a labyrinth with nooks and crannies or even half floors. Not only do these nooks and crannies offer cover for perpetrators, but the design also makes it difficult for emergency responders to familiarize themselves with the building layout, according to Timm. To alleviate confusion, administrators can post clear signs throughout the school to help visitors and emergency responders navigate the hallways. Schools also should make diagrams and floor plans available to first responders and local authorities. “I encourage schools to consult their emergency responders in this process. Invite them to your building. Many emergency responders will recommend schools label hallways and exterior classroom windows to make reporting easier,” Timm says. Additionally, schools can do other small things that do not require construction or remodeling, and will have a positive impact. Student locker banks can be trouble areas. 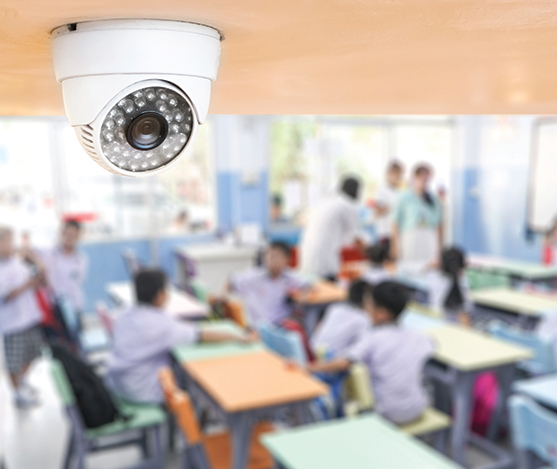 Schools can install tools that promote surveillance in those areas, like convex mirrors or cameras. Also, the addition of vehicle barriers in front of buildings can prevent a perpetrator from driving into entrances, playgrounds, athletic fields, or gathering spaces. Camouflage as a security and evasion: Just like octopuses, skates, and sting rays use camouflage to escape predators, we might adapt bulletproof electrochromic windows that turn opaque to prevent intruders from seeing in. During a typical class day, the glass would allow for ultimate transparency, with a clear line of sight connecting students to the hallways, the outdoors, etc. Collective security: Study the prairie dog. Its calls contain specific information about a predator: how big it is and how fast it’s approaching. How can our response match the detail and speed of prairie dogs? Hard exterior; interior sanctuary: Similar to a box turtle, a secure exterior can close down in an emergency, but still provide a sanctuary in the center of the school. By providing interior courtyards, the schools can still have the environmental benefits of daylight and landscape, which helps connect with our emerging understanding of circadian rhythm. Creating landscaping features such as healing gardens also can reduce stress and anxiety. Controlled access: This doesn’t have to be a chain-link and barbed wire. Sandy Hook Elementary has a beautiful solution with retention swales and bridges. This forces everyone through one point of entry that can be controlled, and the swale puts the intruder at a disadvantage to the other entry points as they are lower. to security and have been implemented on college campuses, military bases, and other secure facilities. School board presidents, board members, superintendents, and their principals are answering the public mandate to guard our students against new threats that couldn’t have been conceived at the time many of our existing school buildings were constructed. School safety experts, law enforcement, and architectural firms are available with assistance. Charles Sosnik (charlessosnik@aol.com) is an education journalist and editor based in Charlotte, North Carolina.